Professor Gil Weinberg has already built a band of robotic musicians in his Georgia Tech lab. Now he’s created a robot that can be attached to amputees, allowing its technology to be embedded into humans. The robotic drumming prosthesis has motors that power two drumsticks. The first stick is controlled both physically by the musicians’ arms and electronically using electromyography (EMG) muscle sensors. The other stick “listens” to the music being played and improvises. 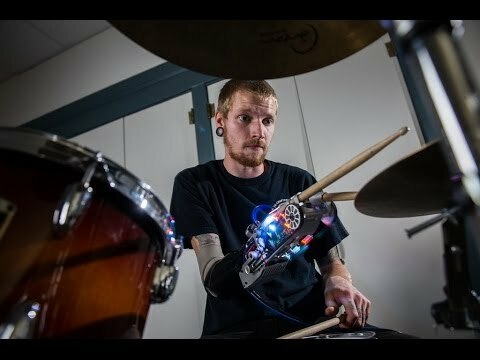 The prosthesis was created for Jason Barnes, a drummer who was electrocuted two years ago and lost his right arm below the elbow. The Atlanta Institute of Music and Media student built his own prosthetic device shortly after the accident. It wasn’t very flexible. He could bang the drums by moving his elbow up and down, but couldn’t control the speed or bounce of the stick without a wrist or fingers. That’s when Weinberg stepped in to create a single-stick device with sensors that responds to Barnes’ bicep muscles. “Now I can flex and send signals to a computer that tightens or loosens the stick and controls the rebound,” said Barnes. Regardless of how he uses the extra stick, the new prosthetic has already given Barnes capabilities he hasn’t had since before the amputation. It’s only the beginning for Weinberg. He’s using a National Science Foundation grant (IIS- 1345006) to expand the technology. For Barnes, it’s all about the music. Because an embedded chip can control the speed of the drumsticks, the prosthesis can be programmed to play two sticks at a different rhythm. It can also move the sticks faster than humanly possible. Barnes will play with the device for the first time publicly on March 22 at the Robotic Musicianship Demonstration and Concert at Kennesaw State University’s Bailey Performance Center. The free event, which will also feature Weinberg’s Shimi robot, is part of the Atlanta Science Festival.